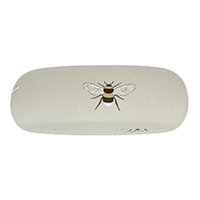 Sophie Allport Bees Glasses Hard Case keeps your glasses safe and prevents them from being squashed. The outer case is made from matt oilcloth whilst the lining is soft velour. It's a stylish and practical accessory for your reading glasses, sunglasses or bifocals and makes a great gift for any friends or family that wear glasses. Includes a Sophie Allport cleaning cloth for your glasses. Oilcloth is waterproof and fairly stain resistant but beware of tomato based sauces and products including tomato ketchup, bolognese, curry, red berries and some felt-tip pens as they have been known to cause staining. Fading may occur under direct sunlight for extended periods of time since the Oilcloth does not contain a UV inhibitor. Oilcloth cleans up well with a warm, soapy sponge then dry it off with a soft cloth or towel. Stains should be wiped as soon as possible and can be faded with bicarbonate of soda.